Pita bread is a soft Middle eastern bread which has pockets in which hummus, tahini, falafel and salad is scooped to make popular falafel sandwiches. Pita bread can be cut into traingle shape and baked in oven too to make crisp pita chips to accompany dips and salsa. Pita is baked at high temperature causing it to rise and create pockets which remain even when it gets deflated on cooling down. I love middle eastern food. Its healthy, lemony, garlicky and made with super fresh ingredients and fruity extra virgin olive oil. Fattoush salad, Tabbouleh, hummus and Falafel sandwiches are all my favorites. I always cut left over pita bread into triangles, dress them in olive oil, salt and paprika and bake in oven to make crisp pita chips which go into my amazing Fattoush salad made with lemony sumac dressing. My family also enjoys snacking on them with hummus. Key to making good pita bread is really to rest the dough and then bake at very high temperature in oven.You have to bake it just enough so that it gets slightly brown after rising, else it will become hard. Soft and pillowy Middle eastern pita bread for great falafel sandwiches and crisp pita chips. Dissolve yeast in half cup lukewarm water along with sugar and set aside for 15 minutes. Add whole wheat flour and salt in a deep bowl and mix together. Make a well in the flour with the help of a spoon and pour olive oil and frothed yeast. Bring flour in gradually from sides and start kneading the dough. Add as much more water as required and knead till the dough is smooth and springy. Grease the same bowl with some oilve oil and place the dough. Cover with a kitchen towel and place the bowl in a kitchen cabinet and set aside for one hour or till dough has doubled in size. Now knock out air from dough again and knead it again for 5 minutes. Divide the dough into 8 equal smooth balls. 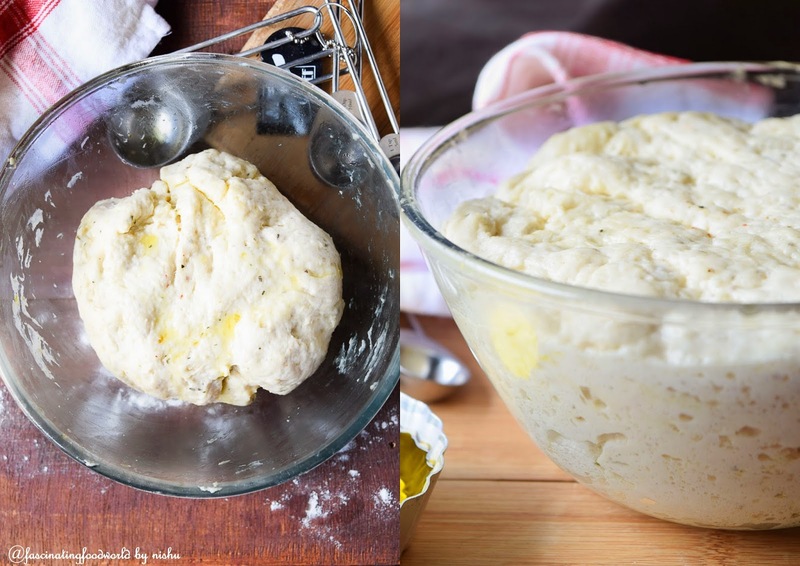 Cover dough balls again with a kitchen towel and rest them for 15 minutes. While dough balls are resting, preheat oven at 250 degrees Celsius for 10 minutes. For best results, place them on the back side of baking tray and bake. Cool them down once out of oven, cut into two halves with a help of scissor and stuff with your choice of filling. Follow me on Instagram, Pinterest , Twitter and Facebook for regular updates on new recipes.